A report from the Institute for Industrial Productivity and David Gardiner and Associates presents a road-map that states can use to capture the economic and environmental benefits of Combined Heat and Power (CHP) and comply with the EPA’s proposed Clean Power Plan, a revised version of which President Obama unveiled to the nation on Monday. A typical CHP unit produces electricity with half the emissions of conventional fossil fuel generation sources at substantially less cost and and substantially less in the way of environmental degradation and health threats, the authors highlight in the report, which was produced for for the American Gas Association, American Chemistry Council, and the American Forest & Paper Association. Capturing heat from myriad thermal processes to generate power, CHP can be used by institutional, industrial and commercial facilities nationwide, offering a means to significantly reduce carbon and greenhouse gas emissions, reduce energy costs and create jobs in construction, installation and maintenance. In addition to describing how CHP can be incorporated into state Clean Power compliance plans, the report describes how states can measure and verify emission reductions. It also provides a set of relevant tools and information resources. According to the report, CHP can perform well whether electricity prices are determined at a rate or mass-based market system. Whether compliance with either rate or mass limits will be measured unit-by-unit, or fleet-wide, and whether to allow trading with other states. EPA allows states much in the way of flexibility to determine exactly how they comply with the Clean Power Plan. The revised version requires an overall national reduction in greenhouse gas emissions of 32 percent by 2030 with 2005 as the base reference year. States and facilities managers, for their part, will invariably take different approaches in complying, the report authors note. Among the examples provided is the case of Philadelphia Gas Works. The municipal utility addresses the hurdle of up-front capital costs by providing loans to commercial and industrial customers for small- and mid-size CHP systems (70 watts to 7 MW to date). Another example comes from New Hampshire, where in 2012 the state Public Utility Commission amended its net-metering rules to include CHP systems up to 1 megawatt. 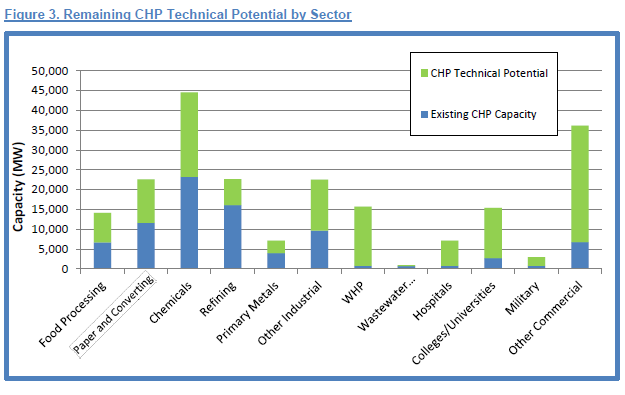 Several aspects of the rules are favorable for CHP in particular, according to the report. Though it caps CHP at 4-MW of the state’s 50-MW aggregate net-metering limit, this allows facilities which are planning to make use of CHP to size their systems to match their thermal load, as well as sell the surplus electricity supplied to the local grid back to the utility. Viewed as perhaps President Obama’s strongest action on climate change yet, the new version of the Clean Power Plan was produced in light of public comments. Presenting it to the nation, the President said: ¨We have a moral obligation to leave our children a planet that’s not polluted or damaged.